George Graham Reviews Louise Grasmere's "Blue Ain't Only Blue"
The commercial media loves stars, about whose exploits we hear endlessly. In the music business, there are those who become the darlings of the commercial media, and the great majority of performers who don't. And most savvy music fans know that fame and fortune have almost nothing to do with musical talent, despite the horrible travesties of so-called talent shows on commercial television. Of course, this program has always been about hearing the great music out there by artists who have not been deigned to be stars by the commercial media powers that be. All of that is hardly news, and it isof course, the underlying assumption behind what I do here as part of my job of wading through the tremendous volume of music being released these days. Almost every day, there are worthwhile new CDs by performers who will never get the blessing of the commercial media to make them stars. And as a corollary, I often find that music that I passed over as being not up to the level of quality we expect, turns out to be the commercial hits, for whatever reasons. That having been said, every so often, a CD comes along that is sufficiently compelling, both in content and circumstance, that it is a vivid reminder of just how much of a infinitesimal fraction of the worthwhile music that exists around the country ever gets to be heard by wider audiences. This week's CD as an excellent example of one of those great performers who makes one ask, "Where has she been for all these years?" 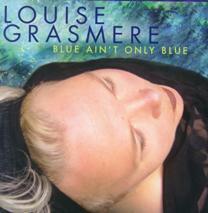 The artist is Louise Grasmere, whose new CD is called Blue Ain't Only Blue. And the answer to that question is Arlington, Massachusetts. Louise Grasmere is a versatile and eclectic vocalist and songwriter, who has been performing in the Boston area for the past 14 years, singing jazz, pop and blues. What makes this CD so intriguing is that Ms. Grasmere turned 48 on the day she completed this, only her second album, and it's the first with her original compositions. And it's an absolute gem, a remarkably tasteful, and understandably mature recording that spans Ms. Grasmere's musical interest including blues, soul, a little funk, along with a folky singer-songwriter facet, even extending to a bit of country-tinged steel guitar. She is joined by a first-class band including guitarist and co-producer Kevin Barry who has worked with Mary Chapin Carpenter and Lori McKenna among others, and Boston's great studio drummer Lorne Entress. Ms. Grasmere herself is a worthy vocalist with a great range and an understated style. Sometimes she can remind one of Phoebe Snow with less vibrato. She is not really a blues shouter, and her approach to soul is decidedly in the so-called blue-eyed soul vein. She handles everything so well that in a way, her singing can melt into the overall music. And if there is a downside, it is that her vocals can sometimes approach being nondescript, without any particular standout traits or flaws. But this CD manages to do just about everything right, with a great band, and some excellent original material by Ms. Grasmere. She also draws on a couple of old spirituals, a blues by Buddy Guy, and a classic soul ballad by Percy Mayfield. Massachusetts singer and songwriter Louise Grasmere has made a very impressive first album of original music at an age when most commercial pop stars have long since retired or burned out. At 48, she brings a sense of authenticity to her music, and can sing the blues in that indescribable way that only seems to come with age. Her laid-back, yet wide-ranging style exudes elegance and taste, and the band on this CD is absolutely first-rate. The CD also reflects the broad musical interests of Ms. Grasmere, covering a fair amount of stylistic ground, sometimes more successfully than at others. But overall, it's an outstanding release that may help to introduce wider audiences to this fine late-bloomer. Our grade for sound quality is an "A." I can find little to gripe about. The mix quality and sonic clarity are commendable. The dynamic range could be a little better, but that is true of most CDs today. Blue Ain't Only Blue is the kind of CD that can really grow on you with time, with lots of subtle details that reveal themselves with each successive listen. In a way, I suppose that is emblematic of Ms. Grasmere herself. She writes on her website that at her age she is feeling more freedom and more willingness to take risks than in her youth. As she says in her song, "Sometimes you Bust Out Later On." Ms. Grasmere has certainly done that on her find new album.